LOS ANGELES, CA--(Marketwired - Oct 15, 2013) - Burton Cummings (www.burtoncummings.com) recalls sitting in his high school class one day, doodling pictures of records he dreamed he would someday make with his band's name on them. That dream is still alive and thriving in the digital age. 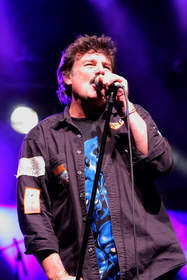 Cummings is still performing classics like "These Eyes," "American Woman," "Undun," "No Time" and "Share The Land" and his biggest solo hit "Stand Tall" -- among countless others -- on tour every year across the U.S. and his native Canada, where The Guess Who was inducted into the Canadian Music Hall of Fame in 1987. Enthusiastic, creative and fully embracing social media to stay in day to day touch with several generations of fans, Cummings looks forward to wrapping his busier than ever touring slate this year with a batch of East Coast dates in mid-November, then launching 2014 with his first-ever headlining shows in Las Vegas, January 17-18, 2014 at the Orleans Hotel and Casino. No doubt, Cummings' loyal fans will be sharing photos and videos from concerts on his new real-time website, which has been filling up quickly with live performance photos and videos (from recent shows and over the years) via Facebook, Twitter, YouTube and Instagram since Burton sent out a recent Tweet encouraging fans to take photos and videos during concerts and to share them on social media using the hashtag #BCLIVE. Photos and videos are displayed in real time on the homepage of BurtonCummings.com, creating an exciting sense of immediacy and community among excited fans. Cummings has been asked many times about writing an autobiography, but has found what he considers to be a more dynamic way to document his fascinating life and career: through a series of DVD documentaries called "RUFF." The soon to be released, 86-minute "RUFF, Vol. 1" includes concert and sound check footage, including clips from his 2000-2001 Guess Who reunion with Bachman and original drummer Garry Peterson. Volume 1 will be released in November and Volume 2 is already deep in the assembly stage.